Everest Three (3) High passes trek covers the routes of Chola-La 5,420m, Renjo la 5446m and Kongma La 5,535m pass is an adventures and challenging trip in Everest region. On the apex of Everest three passes trek presents amazing sceneries of entire snowcapped peaks which lies in Everest Khumbu area. Through the trip, four over eight thousand mountains can be seen are Mt Everest 8,848m, Cho-yu 8,201m, Makalu 8,463m and Lhotse 8,516m. Crossing High Mountain passes this trek suits for true adventure lovers who are in good health condition and seek to see the entire beauty of the Everest region. 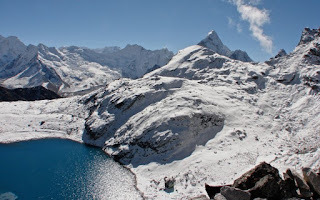 The popular view point like Gokyo Ri, Kalapatthar, Everest base camp, Renjo pass, Gokyo lakes, Namche Bazar are covered on the route. Day 20: Kathmandu free day.